The main difference between Hive and Impala is that the Hive is a data warehouse software that can be used to access and manage large distributed datasets built on Hadoop while Impala is a massive parallel processing SQL engine for managing and analyzing data stored on Hadoop. 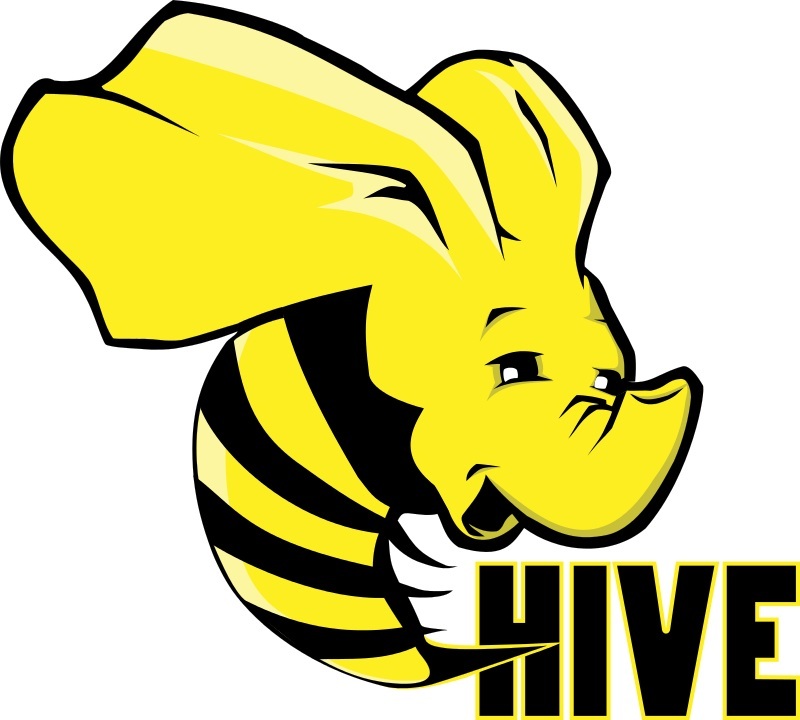 Hive is an open source data warehouse system to query and analyze large data sets stored in Hadoop files. Impala provides the fastest way to access data that is stored in the Hadoop Distributed File System. Both of them are sub tools related to Hadoop. Big data refers to a large data set that has a high volume, velocity and a variety of data. Big data is collected daily, and they cannot be processed with traditional methods. Therefore, Apache Software Foundation introduced a framework called Hadoop to manage and process big data. This is an open source framework. Hadoop consist of two modules: MapReduce and Hadoop Distributed File System (HDFS). MapReduce module helps to process massive structured, semi-structured and unstructured data on large clusters of commodity hardware. Moreover, HDFS is used to store and process data sets. It provides a fault-tolerant file system to run on commodity hardware. The Hadoop ecosystem consists of various sub-tools that help the Hadoop module. Hive is one of them. It was initially developed by Facebook but was later taken by Apache Software Foundation. It helps to summarize big data, make queries and analyze them easily. It provides SQL type language to write queries called Hive QL or HQL. The process of Hadoop interacting with Hadoop framework is as follows. Hive interface sends the query to drives such as JDBC, ODBC to execute query. Then, the drive gets help from the query compiler to parse the query to check the syntax. Next, the compiler sends metadata request to metastore. In return, the metastore sends the metadata to the compiler as the response. The compiler then checks the requirement and resents the plan to the driver. Up to this point, the query parsing and compilation is completed. Then, the drive sends the execute plan to the execution engine. Next, the job is executed. It is a MapReduce job. Execution engine can execute metadata operations with metastore. And, the results are fetched. The execution engine gets results from data nodes. Now, the execution engine sends the results to the driver. Finally, the driver sends results to Hive interfaces. Impala is a massive parallel processing SQL query engine that is used to process a high volume of data that is stored in Hadoop cluster. It is written in C++ and Java. It provides a higher performance than Hive. It provides scalability, flexibility, SQL support and multi-user performance. It allows the users to communicate with HDFS using a SQL type querying called HBase much faster. Furthermore, it can read various file formats such as Parquet, and, Avro. It uses metadata, SQL syntax (Hive SQL), ODBC driver and user interface similar to Hive. It provides a unified platform for batch-oriented or real-time queries. Hive is a data warehouse software project built on top of Apache Hadoop for providing data query and analysis. Impala is an open source massively parallel processing SQL query engine for data stored in a computer cluster running Apache Hadoop. Thus, this explains the fundamental difference between Hive and Impala. The basis of operation is another difference between Hive and Impala. Hive is based on MapReduce Algorithm. Impala is not based on MapReduce Algorithm. It implements a distributed architecture based on daemon processes. It also handles the query execution that runs on the same machines. Furthermore, Hive materialize all intermediate results so that it improves scalability and fault tolerance. Impala performs streaming intermediate results between executors. Hence, Impala is better for interactive computing than Hive. Moreover, Impala is faster than Hive because it reduces the latency. This is a major difference between Hive and Impala. Another difference between Hive and Impala is that the Hive is a batch-based Hadoop MapReduce while Impala is a massive parallel processing SQL query engine. Besides, in Hive, the output of the query is produced as it is fault-tolerant while a data node goes down during the execution. In Impala, query execution starts from the beginning while a data node goes down during the execution. Hive supports complex types while Impala does not support complex types. 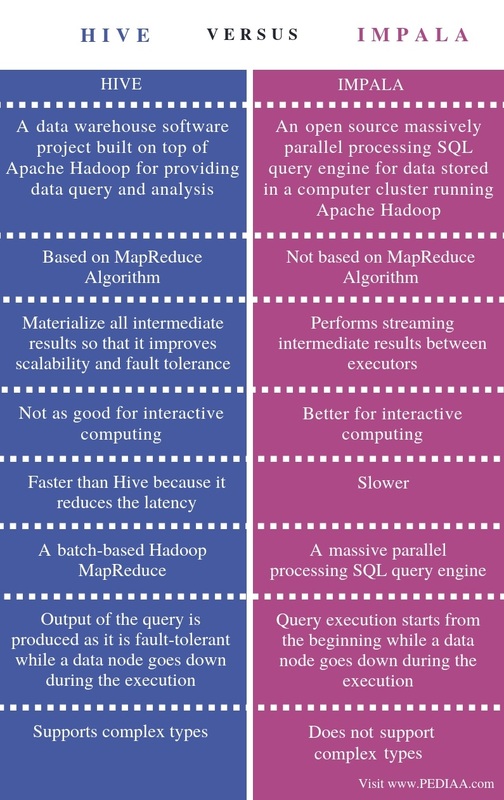 The difference between Hive and Impala is that the Hive is a data warehouse software that can be used to access and manage large distributed datasets built on Hadoop while the Impala is a Massive Parallel Processing SQL engine for managing and analyzing data stored on Hadoop. 1. “Hive – Introduction.” Www.tutorialspoint.com, Tutorials Point, Available here. 2. “Impala Tutorial.” Parallax Scrolling, Java Cryptography, YAML, Python Data Science, Java i18n, GitLab, TestRail, VersionOne, DBUtils, Common CLI, Seaborn, Ansible, LOLCODE, Current Affairs 2018, Apache Commons Collections, Available here.